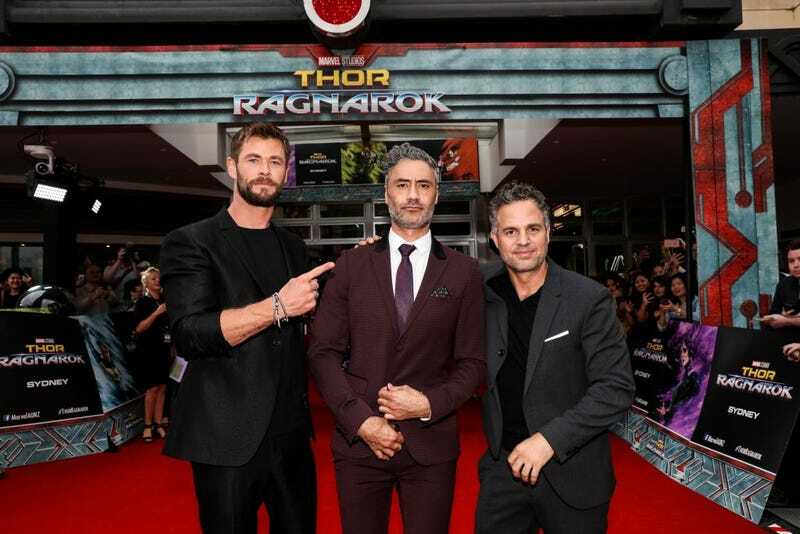 The press crunch has begun for Thor: Ragnarok, with the cast jetting around the world to talk about the coming apocalypse—in this case, a cinematic one, not the one this administration keeps straining toward in real life. Chris Hemsworth and Mark Ruffalo, who play Thor and Hulk, respectively, were up bright and early down under for an interview with Channel Ten’s The Project. The hosts had seen Taika Waititi’s film, which is the third in the Thor series, the night before, so naturally, they had a lot of questions. But one guy was apparently so caught up in a particular twist that he just said it in the course of the interview, whereupon Hemsworth had to remind him that spoilers aren’t cool. And we won’t spoil it for you by posting it here, but here is the video, in case you don’t mind this kind of advance knowledge. By the time Waititi joined the panel, spoiler guy seemed to have gotten it out of his system, meaning the charming Marvel trio were then able to properly go about plugging the film by revealing who among them is the funniest.